Note: Similar to my recent "deflategate" post, the following utilizes SportVU data on player and ball position. Sadly, this data was walled off from the public nearly a year ago, meaning what analysis I can do has a limited shelf life. This version of the post had been ready for some time now, but I had intended to expand its scope. However, given the data is nearly a year old, I thought it was best to publish what I had, even if I still consider it incomplete. The purpose of these posts is to assess what makes for good free throw shooting. The NBA's SportVU system tracks the position of the ball in all three dimensions. I have taken that raw, often messy data and organized it using some freshman level physics. From that simple model, I have created a whole host of new descriptive statistics on player shooting mechanics. In my first deep dive, I examined how vertical release angle (i.e. high arc, low arc) correlates with free throw success. As it turns out, there is little correlation between the arc of a player's typical shot and their accuracy. For every "high arc" sharpshooter like Stephen Curry, you have equally successful "low arc" shooters like Kyle Korver; or spectacularly unsuccessful high arc shooters like Andre Drummond. I did find a (unsurprising) correlation between consistency in release angle and free throw percentage. In this post, we will shift focus from the vertical axis to the horizontal. Where do players typically "spot up" from the free throw line, and how important is it to pick a consistent spot? 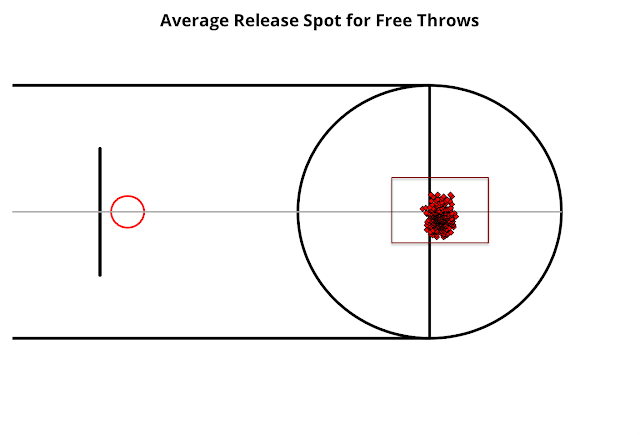 We'll start with where players tend to release their free throw shot. For all the analysis below, I am using SportVU data going back to the 2013-14 NBA season and ending, sadly, on January 23, 2016 - the date the NBA removed detailed player tracking data from stats.nba.com. Also, I am excluding all games played at the Warriors' Oracle arena. For reasons unknown, the Oracle SportVU data is very messy and its inclusion was skewing player statistics, particularly those related to consistency. The chart below shows the average release spot for some 326 NBA players (a player needed to have at least 100 free throws in order to be included). Note how the distribution shows a clear bias to the bottom half of the chart. Players appear to like to shoot away from their body, as opposed to across their body, so a right handed player will line up somewhat left of center. And it is no coincidence that the players lining up furthest right of center are left handed shooters like James Harden, Tony Wroten, and Josh Smith. David West and Ricky Rubio line up, on average, some 14 inches left of center when shooting free throws. Eric Gordon has one of the most forward-leaning release points - the ball has already crossed the free throw line by the time it leaves his hand. Contrast that to Marcin Gortat, who tends to release the ball more than a foot behind the line. 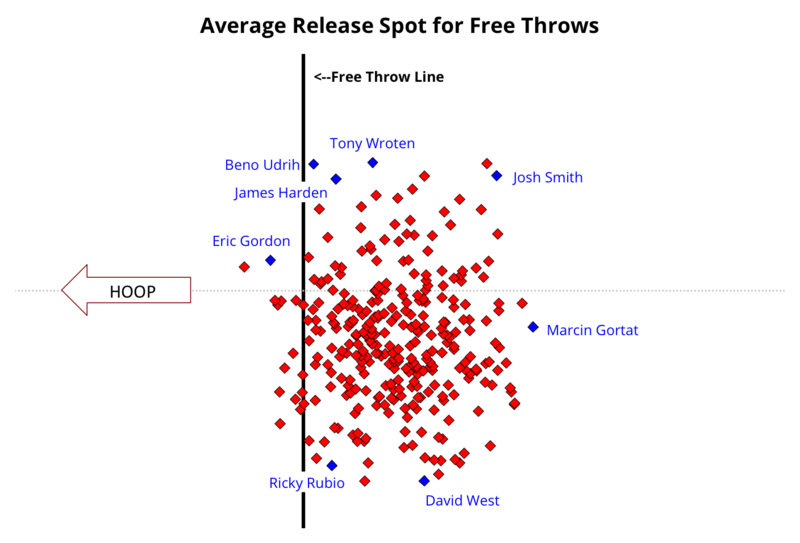 Shooters with a more distant release position, like Gortat, tend to be poorer free throw shooters. Release distance (along the horizontal axis in the chart above) has a correlation coefficient of -0.175 with free throw percentage. Left/right release position (vertical axis above) is largely uncorrelated with accuracy, with a coefficient of +0.067. What about consistency? Good free throw shooting, presumably, is borne out of practice and repetition, until shooting motion becomes routine. But without a consistent starting point, proper muscle memory may never develop. Are there players that are, either through inattention or inability, less consistent in shooting from the same spot? 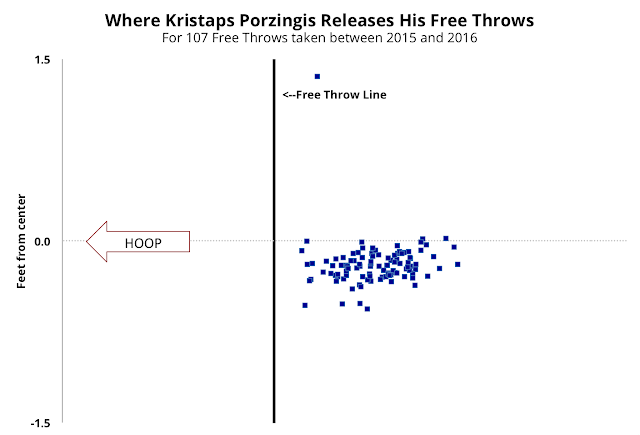 And is that inconsistency correlated with inaccuracy from the free throw line? Players that consistently release the ball from the same spot tend to be better free throw shooters. That correlation is most apparent when focusing on left/right consistency (i.e. distance from the sideline). Andre Drummond is a historically bad free throw shooter, and it appears that may be due to an inability to pick a consistent spot to line up his shots (but more on Drummond in a bit). In addition to Andre, you also have below average free throw shooters such as Steven Adams, Nerlens Noel, and Rajon Rondo, who are also below average on this metric. 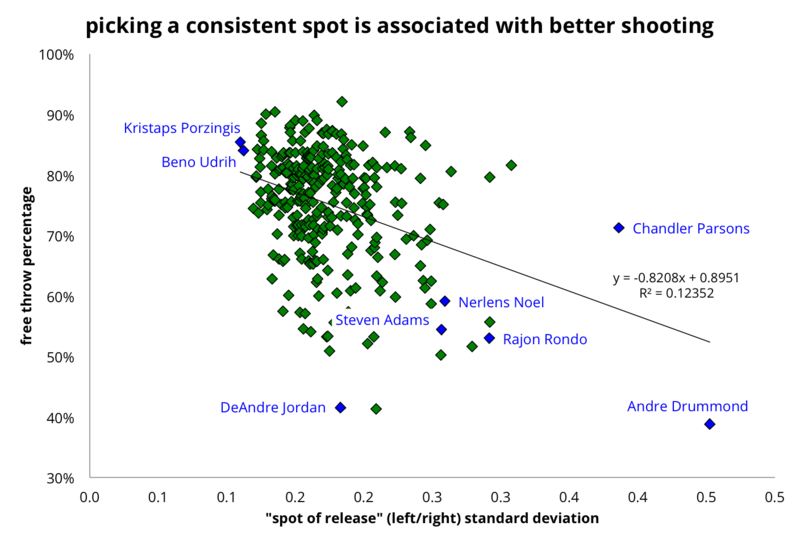 DeAndre Jordan, however, is pretty much in the middle of the pack by this measure. Jordan's struggles seem to be more of the "too hard" or "too soft" variety (he leads the league in air balled free throws, by my count). Porzingis keeps his release point in a nice, tight band just a few inches left of center. Drummond, on the other hand, is, literally, all over the place. He even has a significant number of attempts from the "wrong" side of the center line where you typically only see left handed players shoot from. Perhaps this is why Drummond is such a poor free throw shooter? If he could just focus on shooting from the same spot each time, maybe he could improve on his 38% career free throw percentage? It turns out it may not be that simple. 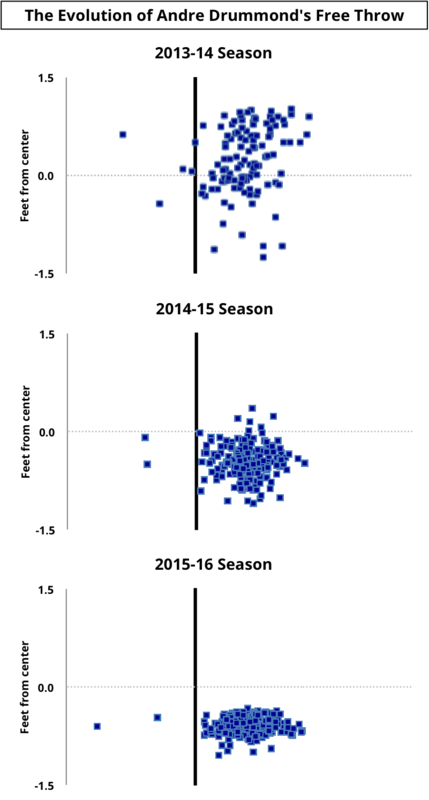 I took a closer look at Drummond's free throw release point, and split it by season. Drummond's release point was at its most chaotic in the 2013-14 season, where he often took shots from the right (i.e. "wrong") side of the hoop. Things improved next season, with Drummond shifting his starting point to the left, and showing improved consistency . Prior to the 2015-16 season, the Pistons hired renowned shooting coach Dave Hopla to improve upon the Pistons 27th ranked field goal percentage. Hopla has worked directly with Drummond on various aspects of his free throw shot, including limiting his pre-shot dribbles to three, narrowing his "base" (I'm assuming this refers to his stance), and keeping his "toe to the target". Hopla's coaching seems to be working, at least from the standpoint of release consistency. 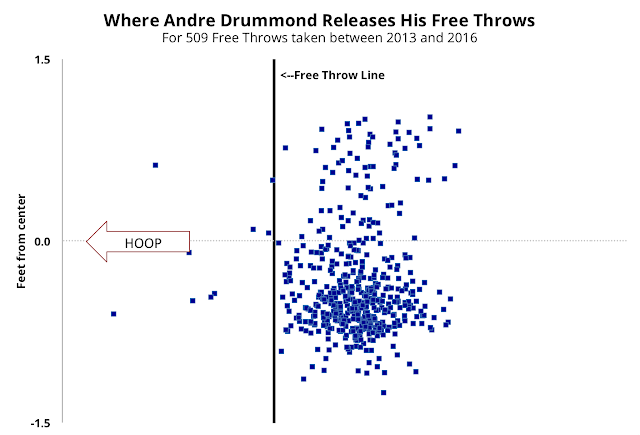 Drummond's 2015-16 release point scatter plot shows an even tighter distribution. Over the past three seasons, the standard deviation of his horizontal release position improved from 0.51 to 0.26 to 0.13 (the league average for 2015-16 was 0.13). 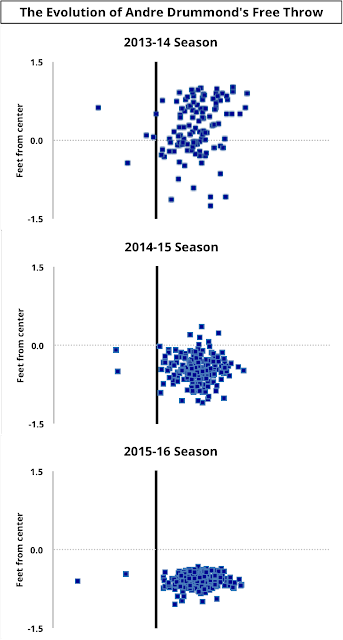 However, this improvement in consistency did not lead to better shooting. Andre Drummond finished the 2015-16 season with a career worst 35% free throw percentage.